Standard footrests do not meet the need of all clients. Fitting clients with severe lower extremity positioning requirements is limited by range of motion loss, orthopedic asymmetries, and the dimensional setup of the wheelchair. Seat to floor height, seat width, seat depth, leg length, caster size, orientation in space of the seating system, and anything consuming space must be considered, as these all have the potential to limit proper positioning. An offset receiver is available on some wheelchair bases which moves the Static Footrest laterally by 1 inch. Watch a video of our Footrest Adapter. 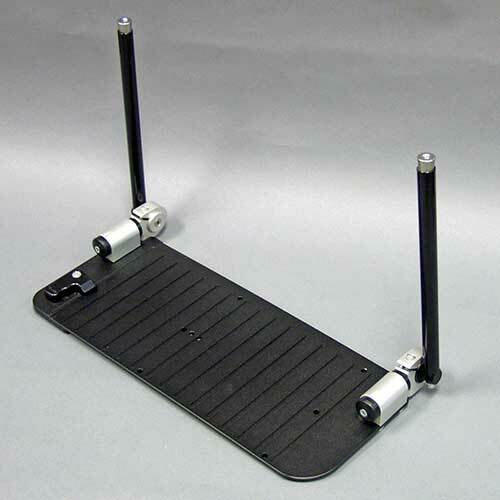 Standard footrests are available at angles of 90, 80, 70, and 60. This variety does not meet all client needs and so the Adjustable Knee joint allows unlimited adjustment in 7.5 degree increments. This joint is extremely strong, capable of supporting hundreds of pounds of static force, and therefore prevents movement. Watch a video about our Adjustable Knee hardware. This footrest style uses a combination of an Adjustable Knee joint and an Adjustable Windswept joint to accommodate a windswept tendency. In this scenario, one leg is abducted and the other adducted. This modification supports the feet in this position. Overcorrecting a windswept tendency can lead to pelvic rotation. The Adjustable Windswept Option can also be used to accommodate bilateral hip adduction or abduction. This modification allows the feet to be supported behind the distal edge of the seat, accommodating significantly limited knee extension (knee contractures). This modification may need to be used in combination with the plantar/dorsi flexion extension to match the angle of the ankle. Note: Due to the limited amount of space available under the wheelchair, a smaller footrest is usually required. These footrest extensions are designed specifically for the Static Footrests. Extensions are available in both short (6”) and long (9”) lengths, measured from the end of the footrest tube. Overall footrest length is determined by the Footrest Style and Footrest Extension combined. This extension provides dorsi and plantar flexion adjustment in 7.5 degree increments. This joint is extremely strong to prevent movement. We offer small (4×6), medium (5×8) and large (6×10) foot plates. The length is best determined by the length of the client’s foot and the wheelchair width. Our footplates are heavy duty ¼” aluminum with pre-drilled holes for mounting foot positioning accessories such as shoe holders and flip-up for transfers. Manual and Power Wheelchairs include footrest hangers with footplates as a standard option. The footrest hangers typically swing-away and the footplates flip-up to move out of the way for transfers. There are times when standard footplates do not meet the needs of an individual client and a footboard is required instead. A footboard may also be recommended when the current footplates chronically sag down medially, despite adjustments. The footboard is rigid and prevents sagging, and the subsequent foot pronation, from occurring. Keep in mind that other Seating Dynamics hardware (listed above) can also prevent this sagging, as the components maintain their position. Seating Dynamics Static Footrests are being recommended to accommodate the feet in an atypical location that cannot be supported by standard footrests.